Malicious applications are one of the most serious threats to smartphone users today. Not only can a dangerous app infect your phone and steal your personal information, it can even spy on you. 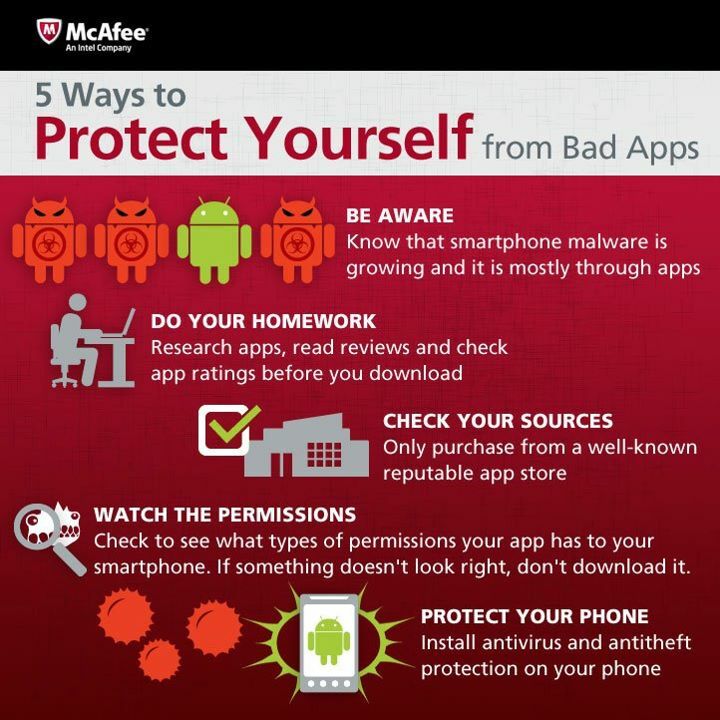 Read our five easy tips for avoiding bad apps, and keep your device and information safe. An Android developer recently discovered a clandestine application called Carrier IQ built into most smartphones that doesn't just track your location; it secretly records your keystrokes, and there's nothing you can do about it. In this digital age, privacy is more important than ever. Just because you “don’t have anything to hide,” does not mean that you shouldn’t value your privacy or fight for it when companies do things like this, especially with something as personal as your cell phone. McAfee has come up with five “Common sense” practices that you might not have thought about before, but they actually do make sense for the most part. For the moment, the amount of detected smartphone malware is relatively low compared to malware that targets desktop or laptop PCs; but being aware that it exists is the first step toward protecting yourself and your data. It is wise to purchase from a well-known reputable app store market, such as the Android Market. One way for Android users to avoid installation of non-market applications is to de-select the “Unknown sources” option in the Applications Settings menu on their device. If the option is not listed, it means your mobile service provider has already done this for the user. When you install an app, you’ll see a list of permissions for services that are granted access to the hardware and software components on your device, like contacts, camera and location. If something in the permissions screen doesn’t look right, don’t install that app! For example, a game or alarm clock app probably shouldn’t need to access your contacts or have the ability to transmit that data from your device. Install antivirus software on your phone. It is a good idea to install an antivirus program when you get a new mobile device before you add any other apps. This last one actually be the most crucial one that people are missing. McAfee argues now that because smartphone and tablet sales are eclipsing those of desktops and laptops, cyber crime is surging in the mobile sector.